The state is about to release more than 24,000 pages of Sarah Palin’s emails from her time as governor. But officials are also going to withhold another 2,415 pages the state deems privileged, personal or otherwise exempt from Alaska’s disclosure laws. News organizations and individuals requested the Palin emails under Alaska’s public records law more than two years ago when she was running for vice president. The messages are finally now about to be released as the former governor contemplates a bid for the presidency. State officials expect to send the emails to a commercial printer to be copied this week, a process that is estimated to take about four days. Django Unchained, where an escaped slave, played by Will Smith, seeks to free his wife and exact revenge on his former masters. Incidence of the most common type of brain cancer in the U.S. has dropped 0.4 percent per year between 1987 and 2007. This would be about the very same period that we all started using cell phones. That doesn’t necessarily mean the drop wouldn’t have been steeper had we not used cell phones. And it doesn’t necessarily mean cell phones don’t have a long-term effect that we may see in years to come. It does mean that brain cancer incidence has plummeted just as cell phone use has taken off. The bottom line is that there has been a big and welcome decrease in homicide rates in Europe and America over the past several centuries. To put these numbers in perspective, however, note that the homicide rate in New Orleans today is 52 per 100,000 and in Detroit it’s 40 per 100,000 so even with a lower average there is lots of variation. If we all mechanically bought American, wouldn’t we allow manufacturers to avoid competition and rely on their locations rather than the excellence of their products? Sounds like the opposite of exceptionalism. Harsanyi connects this to companies in America that are taking government handouts or have been propped up when nearly failing by the government. I believe in certain seasons of history this logic may work. This current one doesn’t seem to fit into that mold. I tried the flagship journal of the discipline, the American Political Science Review for articles, full text, and “Alinksy” and got back 3 results (1946, 1968 and 1969). Keep in mind the APSR is indexed back over a century on JSTOR. American Journal of Political Science: 1 (from 2002). Perspective on Politics: 2 (2004 and 2006). Journal of Politics: 2 (form 1974 and 1975). If you search all 116 political science titles for “Alinsky” (without checking to see if they refer to Saul Alinsky specifically) one gets a whopping 55 article. 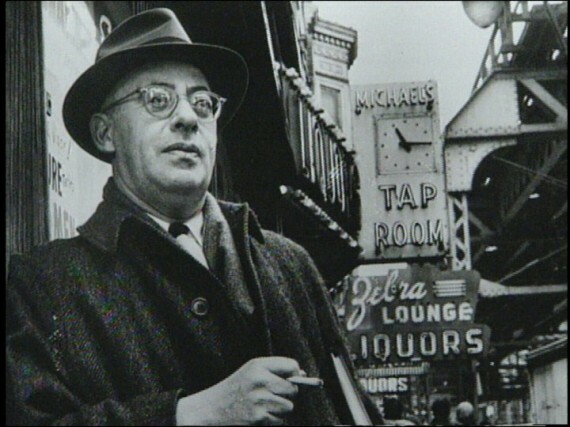 A search of “Saul Alinsky” in full-text article for the 116 journals in question gives me 38 hits, while “Alinsky, Saul” gives me 7. And this is the guy who supposedly is the kingmaker for indoctrinating the liberal intelligentsia at our universities and urban centers? So You Think You’re Poor? Notice how the entire line for the United States resides in the top portion of the graph? That’s because the entire country is relatively rich. In fact, America’s bottom ventile is still richer than most of the world: That is, the typical person in the bottom 5 percent of the American income distribution is still richer than 68 percent of the world’s inhabitants. Now check out the line for India. 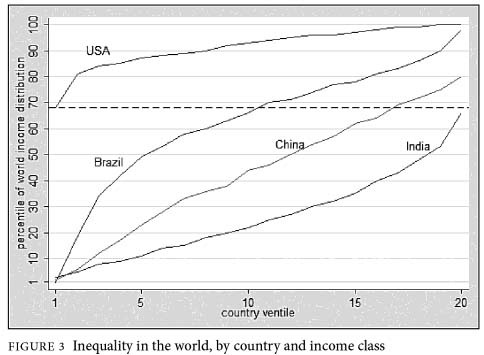 India’s poorest ventile corresponds with the 4th poorest percentile worldwide. And its richest? The 68th percentile. Yes, that’s right: America’s poorest are, as a group, about as rich as India’s richest. One’s income thus crucially depends on citizenship, which in turn means (in a world of rather low international migration) place of birth. All people born in rich countries thus receive a location premium or a location rent; all those born in poor countries get a location penalty. It is easy to see that in such a world, most of one’s lifetime income will be determined at birth.